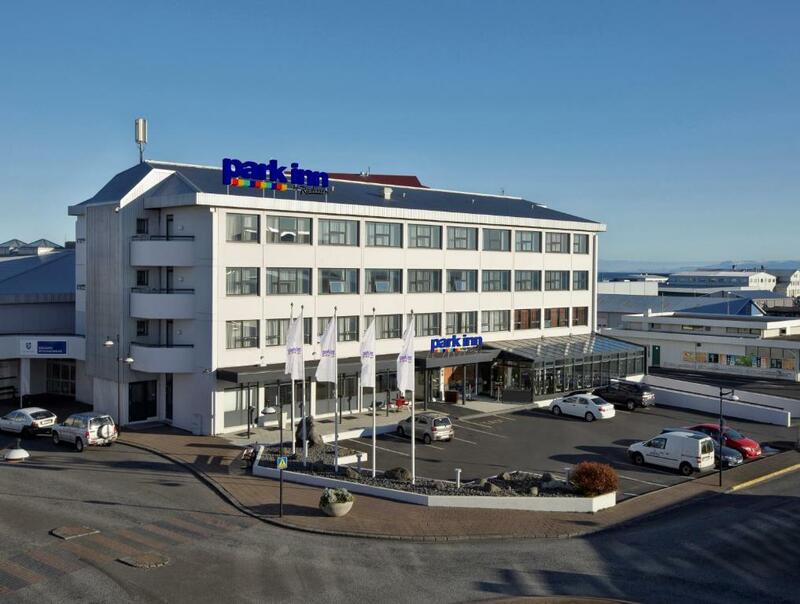 Lock in a great price for Park Inn by Radisson Reykjavik Keflavík Airport – rated 8.5 by recent guests! The concierge/man at the check-in desk was incredibly helpful. He gave us the best tips on how to get to The Blue Lagoon, and arranged everything for us. His advice alone was worth the hotel price but the service he provided was above expectations and greatly appreciated as we were checking in to our room at 4am after a severely delayed flight. The room was large, spacious, clean and very relaxing. Great hotel for an extended layover! Friendly staff. Great shuttle service to airport. Nice room. Olasteina was a pleasure to work with. She was able to provide us with a room early in the day after our overnight flight which was a great relief. She was also very informative as to the local information that we needed. Stayed here on the last night of my trip to Iceland. It was very convenient for the airport which was only a 10 minute drive away. Nice quality hotel but I would only stay here if going to the airport. They also do breakfast from 5am! There are USB outlets and they gave me a room with views of the sea. The staff were excellent and so helpful. The breakfast had a very good selection, the restaurant food was just so interesting and tasty The hotel was clean and quiet. 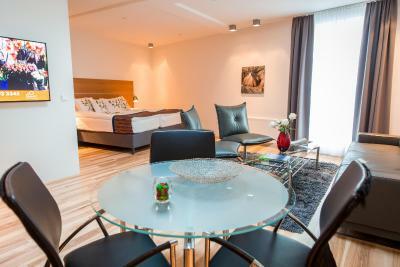 The room was VERY spacious, clean and beautifully appointed. 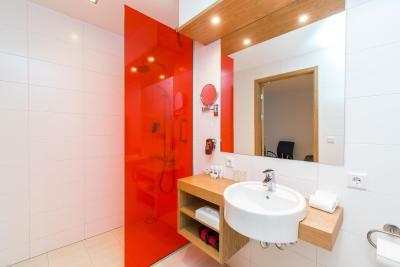 The location was convenient to the airport - a ten minute drive. And did I mention how spacious it was! In downtown Keflavik and close to a nice walking path along the lava rock edged bay. Beautiful views along the walk with informational signs along the path. Probably the best breakfast selection on our trip. 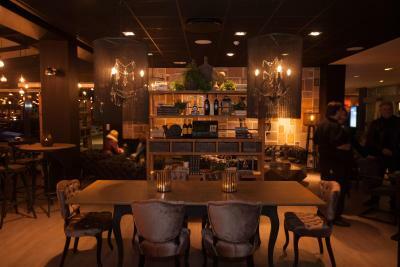 Clean and modern, with attached restaurant, The Library, where we had an excellent dinner on our last night in Iceland. Shuttle ride in the morning to the airport was quick and easy with a very nice driver. Amazing customer service and wait staff during our stay. Our flight was cancelled because of a storm, so we had to stay an extra day in Iceland. The power went out for the entire city. Nobody panicked, nobody complained, it was business as usual, and everybody was helpful and jovial. 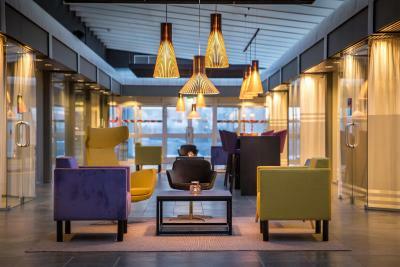 Park Inn by Radisson Reykjavik Keflavík Airport This rating is a reflection of how the property compares to the industry standard when it comes to price, facilities and services available. It's based on a self-evaluation by the property. Use this rating to help choose your stay! 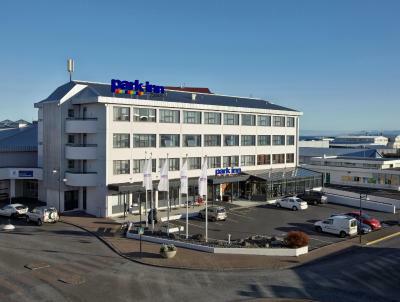 Only a 5-minute drive from Keflavik International Airport, this hotel is located on the Reykjanes Peninsula. 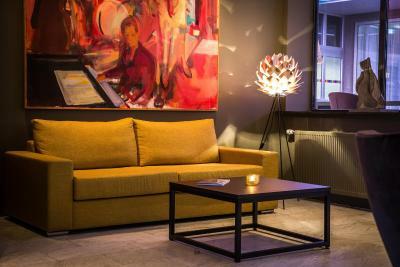 WiFi access and heated, indoor parking are both free. An early 05:00 breakfast is available. 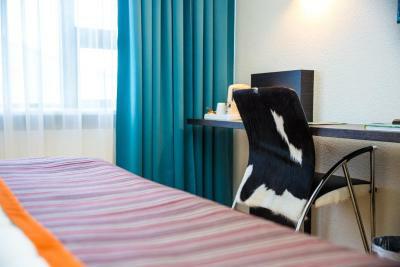 A TV is a standard feature in each room at Park Inn by Radisson Reykjavik Keflavík Airport in Keflavik. 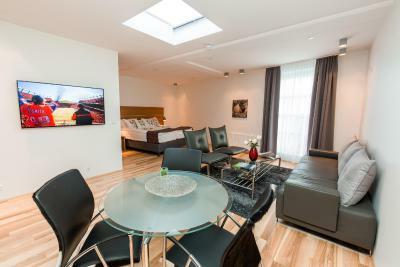 Some also include a spacious seating area, tea/coffee maker and flat-screen TV. 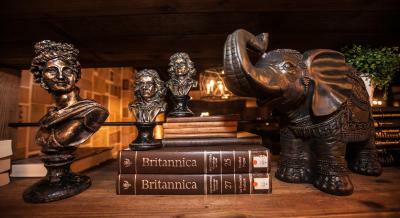 Library, the hotel’s restaurant and bar, serves gourmet cuisine in a stylish setting. 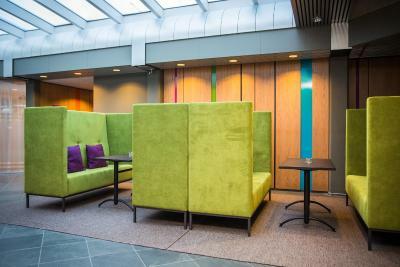 Park Inn by Radisson Reykjavik Keflavík Airport in Keflavik's guests can enjoy a shared computer in the lobby. The hotel offers a free shuttle service to the airport in the morning and can arrange transportation to the Blue Lagoon, 12 mi away. 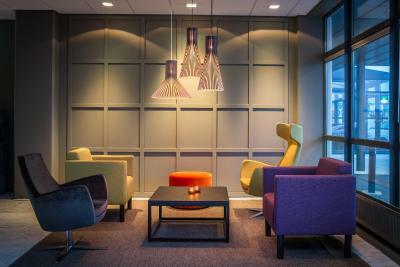 When would you like to stay at Park Inn by Radisson Reykjavik Keflavík Airport? Includes tea/coffee facilities and a satellite TV. 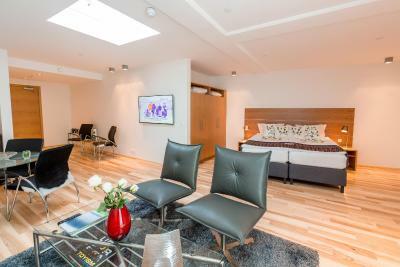 Consisting of 2 interconnected rooms, this family room features a seating area, 2 bathrooms and an electric kettle. 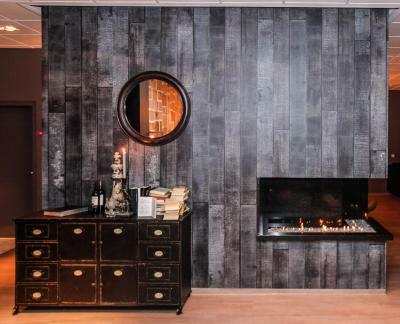 This suite has a electric kettle, soundproofing and seating area. 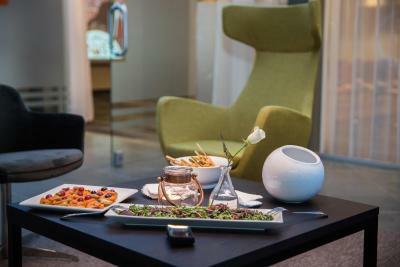 House Rules Park Inn by Radisson Reykjavik Keflavík Airport takes special requests – add in the next step! 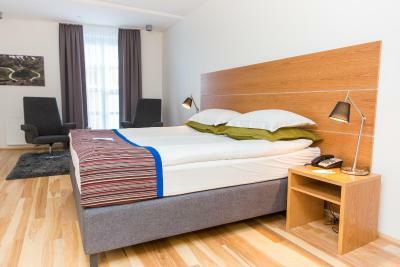 One older child or adult is charged EUR 25 per night in an extra bed. 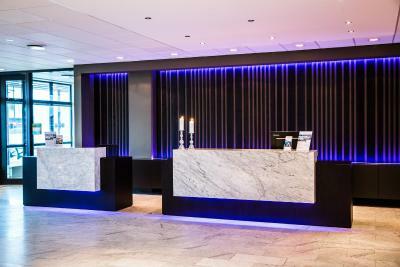 Park Inn by Radisson Reykjavik Keflavík Airport accepts these cards and reserves the right to temporarily hold an amount prior to arrival. Please note that the free airport shuttle service only include morning drop-off at the airport, not pick-up. 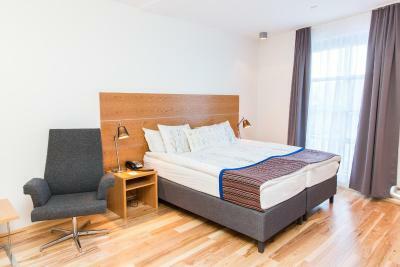 The bed is too soft, but all the beds in Iceland were the same. The hotel is near to the airport but they dont provide shuttle from the airport to the hotel. I took a taxi, 3.200 ISK. I asked for late check out since my bag didnt arrive and I was having some problems and they didnt charge me more. The food of their restaurant was good! We thought $20 was a lot for that basic buffet breakfast. The breakfast itself was fine, but the price didn’t make a lot of sense. Flight was cancelled and we were desperate, expecting the worst accommodations. 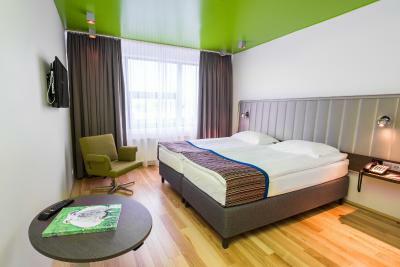 But we were lucky to find Park Inn which was a pleasant surprise with a very convenient location. 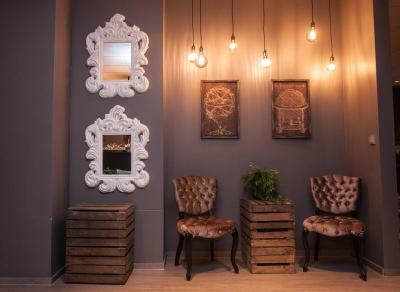 We stayed in some fine hotels on our tour the prior week, and this was actually better than all of them in terms of practical functionality and comfort. The chairs were amazingly comfortable and the bed was fantastic. 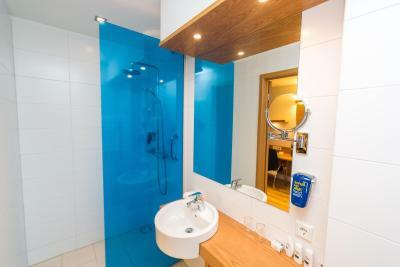 The bathroom and shower were excellent. It's a bit expensive for a mid-line hotel, but I guess that is to be expected given the location. 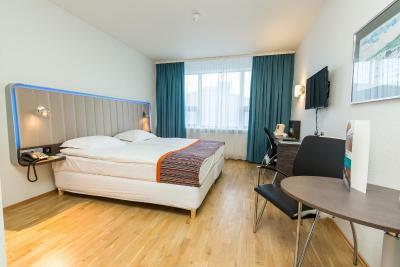 It's close to the airport, has heated underground parking available (when it's not full) and is central to the small city of Keflavik. We did not eat at the hotel, so I cannot offer any insight. However, the 24 hour shopping mart just a block or two North has excellent coffee and a fine selection of food and beverages. Room was not heated when we arrived. Entrance light did not work. Heating in the bathroom did not work. 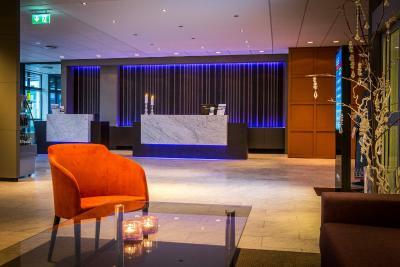 Good hotel near Keflavik Airport. Very good restaurant. Great location if you have an early flight to catch. It's only a 5 minute drive to the airport. Very nice restaurant in the hotel with good food. Placed on forth floor, this floor had a stale cigarette smell, which was not pleasant. I also got a wake-up call at 4.45am which I did not ask for.